There is a spring in my step because we are nearly into Spring! March is a great month to start planning your goals as it feels like a new beginning. So even if 2019 has started with more of a bump than a bang, it’s time to finish what you started. Financial freedom is waiting for you, but you have to put in the work to get there. 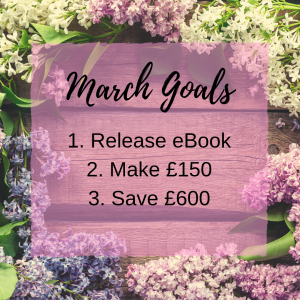 Luckily, you have me to keep you motivated, so here’s my March goals to get you inspired. As someone who is very public about their debt free journey, the number one thing I’m asked is ‘how to get out of debt’. I joined the Instagram #debtfreecommunity in July 2017 with one goal; to pay off £16k of debt in one year. By July 2018, I was debt free and ready to help others learn how I did it. So I decided last year to write my eBook, How to Get Out of Debt, to put everything I learned together. There are many reasons I’m passionate about showing people how to get out of debt. In the UK, we have few relevant resources that help to educate us about debt. We can obviously refer to Dave Ramsey, but it’s difficult to apply Dave Ramsey’s Baby Steps to UK lifestyles. We can’t attend FPU (Financial Peace University) in person. And I know a lot of UK people can’t relate to incomes and debt in the US. How to get out of debt is a topic that few of us in the UK talk about openly, and we are in dire need of starting to talk. Learning how to get out of debt is such a game changer for young people, and I want to be a part of that. The thing about getting out of debt is that it’s so much more than merely making repayments, which is the key message in How to Get Out of Debt. My eBook focuses on how you can adopt the right money mindset and kick your toxic debt behaviour. And obviously it will give you everything you need on your debt payoff, which is covered in four simple stages. How to Get Out of Debt will be out in early March and I’m really excited to share everything I’ve learned while paying off debt! There are so many ways to side hustle. To make money really quickly, I suggest matched betting,where you could easily make £1,000 in a few weeks. If you don’t fancy something a little less daunting, I recommend completing online surveys. YouGov and Prolific are my favourites. I’ve been on the side hustle grind for a long time. Now I’m focusing on side hustling for the long term by creating products that will produce a passive income, like selling my budget planner on Etsy, and releasing my upcoming eBook, How to Get Out of Debt. I’m really passionate about delivering products that I know will help people to conquer their finances. Also, WannaBeDebtFreeUK.com generates income through the use of affiliate marketing. I only ever affiliate with brands I use and trust and know will add value to the journey of my readers. My goal is to make £15o through all of these channels. 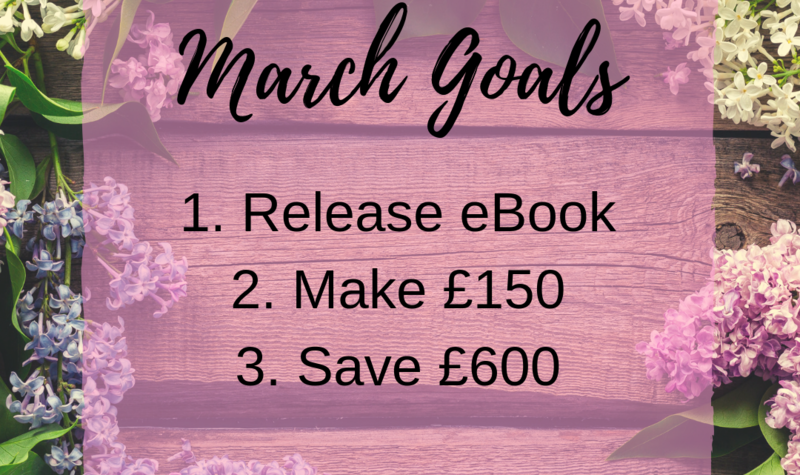 I aim to save £600 during March from our base income and side hustles. To save this much, your budget needs to be completely on point. You need to know the exact amount that you can live comfortably on without feeling deprived and find balance. In some areas, we do spend a little bit more but if it enhances are quality of life, I’m all for it. Since our debt days, we’ve reduced our outgoings by more than £1,000, so saving has become a lot easier. I get asked a lot how to start saving when you have no spare income. My answer would be to save on your everyday spending, and save the difference. For example, go through Topcashback when you’re purchasing. Or download Shopmium and incorporate the free and discounted groceries offered into your meal plan. Then, put your savings straight into the bank. You’ll be surprised how easily you can build an emergency fund by making little changes like this.